Made from durable silicone rubber, Sigma 6’s custom elastomer rubber keypads are available in either conductive or non-conductive configurations to suit any design requirement. The keypad may interface directly with a printed circuit board or with a membrane switch or other type of switches. Our engineering team can assist in building the perfect product that meets or exceeds all of the product specifications and requirements. Our team is always looking for improvements on: design, cost, aesthetics, and complexity. 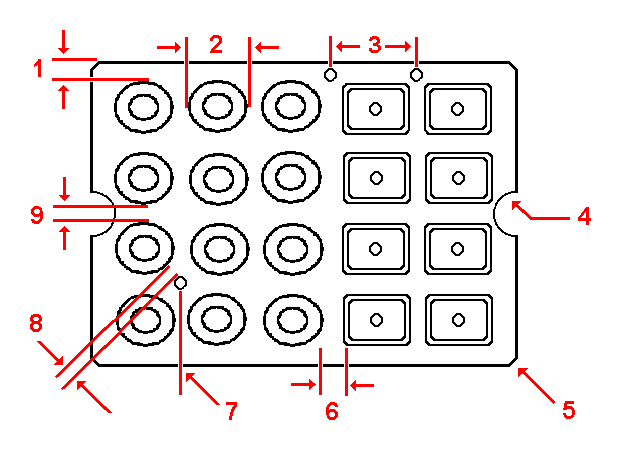 This guide is a basic introduction to rubber keypad design and should be valuable information for engineers looking to add a rubber keypad to a human-machine interface. 1. Minimum distance from edge of keypad: 1.0 mm. 2. Typical membrane dimension: key size +2.5 mm. 3. 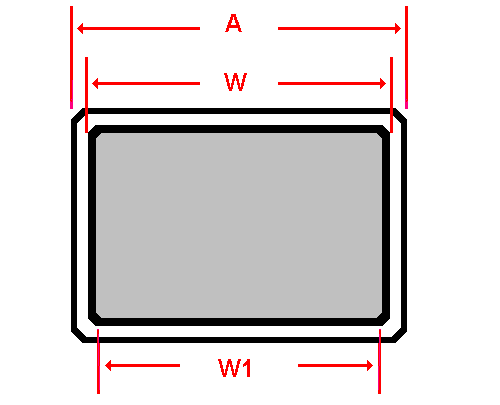 Typical guide hole spacing: 30-50 mm. 4. Minimum radius dimension: 2.0 mm. 5. Typical corner radius dimension: =>1.0 mm. 6. Minimum key pitch dimension: =>4.0 mm. 7. 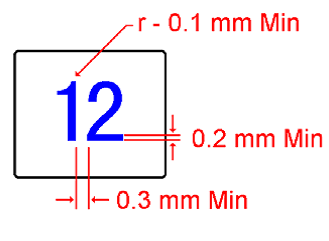 Minimum guide hole dimension: =>1.5 mm. 8. Minimum distance from hole to switch web:1.0 mm. 9. Minimum membrane spacing dimension: 1.0 mm. 1. Minimum clearance between bezel and keys: 0.3 mm. 2. Minimum key pitch dimension: 4.0 mm. 3. Typical pill size dimension (circular pills): 2.0 – 8.0 mm. 4. Typical pill thickness dimension: 0.4 – 0.5 mm. 5. 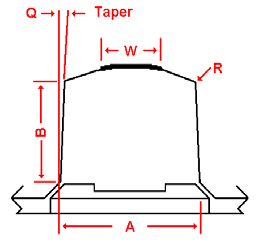 Typical chamfer angle dimension: 45o. 6. Typical chamfer dimension: 0.5 mm. 7. Typical air channel dimension: 1.5 ~ 2.0 mm. 8. Typical base thickness dimension: 1.0 mm. Need pricing on a rubber keypad design application? The majority of elastomer keypads are designed to give a tactile response when pressed. Creating the correct tactile feel is an art that requires design and manufacturing variables to be considered. Defining tactile feel is a very complex task since the final design decision is based upon subjective information. The skill of the manufacturer is critical in ensuring the final keypad has the correct feel. Sigma 6 Electronics brings many years of manufacturing and design experience to each project to ensure that the rubber keypad design is right for the application. Where F1 = Actuation (or Peak) Force and F2 = Contact Force. To design a keypad with a strong tactile feel the snap ratio must be a minimum of 0.4, and ideally 0.5 or greater. A snap ratio less than 0.4 will exhibit a weak tactile feel, but will have a longer life. This relationship may be expressed as a Force Deflection Curve. Another important design consideration is the Return Force (F3), typically 25-30% of the Actuation Force but at least 30 gm to avoid sticking keys.